Yes, I am a geek and so this evening I get an update from Apple that Steve Jobs has done a Keynote Address at 2008 Worldwide Developers Conference in San Francisco. So I power up QuickTime and start to watch, learning that there’s some cool apps coming up called MobileMe and a sneak preview of the next operating system upgrade called Snow Leopard. But I don’t get very far watching the Keynote when I see that Steve looks and sounds alarmingly unwell. We know he’s a San Francisco Zen-style Vegan – and maybe that’s all it is. Hope so. In this keynote he showed off key Apple personnel. It wasn’t just the Steve Show. Sorta interesting. He’s definitely getting across that it’s not all about Steve. But of course, it is. Apple remains silent, as it has done before. We’re keeping an eye on this space. Apple’s iPhone 3G got most of the headlines on Monday after the product was announced at an Apple technical conference in San Francisco. But blogs and other Internet news sites also took note of a gaunt-looking Steve Jobs. “Concern over APPLE Steve Jobs’s physical appearance…” read a headline on the Drudge Report, which linked, without further comment, to photos showing the Apple CEO on stage at the Apple conference. In response to a question about his health Tuesday, an Apple spokeswoman said Jobs was hit with a “common bug” in recent weeks but he still felt it was important to participate in the Apple conference. The spokeswoman said he’s now on the mend with the aid of antibiotics. Jobs’s health is occasionally the topic of chatter because he was diagnosed with a rare form of pancreatic cancer four years ago, for which he underwent surgery that Apple said was successful. (Apple didn’t disclose that Jobs had been ill until after he was on the mend.) Mr. Jobs is also widely considered nearly irreplaceable at Apple, where he has been the architect of a dramatic resurgence in the company’s fortunes over the past decade. Fortunately for Apple, no replacement is needed. BB NOTE: Well he is a devoted vegan after all and perhaps he just went had one too many tomatoes? Stick to apples, Steve. We’ll be glad you did. You noticed that, too, huh? He looked so gaunt that I’m worried for the poor guy. 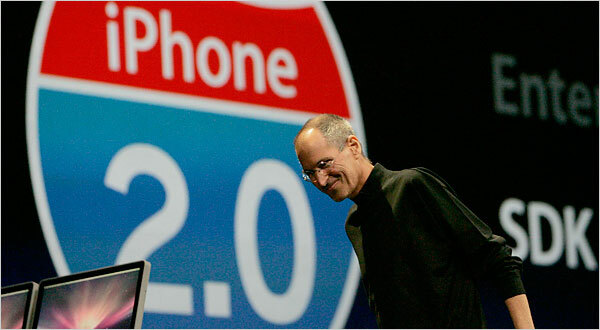 BB – Steve Jobs has pancreatic cancer. He learned about it in Oct. 2003, but didn’t announce it until August 2004. Supposedly it’s a treatable form, but who knows. At first, he tried to treat it with a vegan diet, etc., but eventually had surgery.